Click pics to enlarge the eye candy. 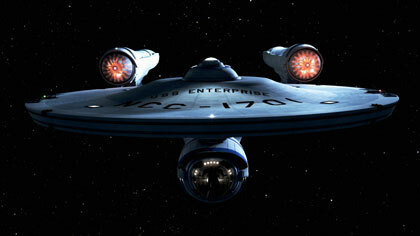 The viral marketing of J.J. Abrams’ anticipated re-imagined Star Trek is all ready well on its way. There is every indication that the approach will mirror the well-craft pseudo-secret teaser-ladened campaign Abrams and Paramount Picture mounted for Cloverfield. Interests piqued over casting choices rolled out over the latter half of 2007, particularly Leonard Nimoy’s return cameo as signature character Spock and Heroes villain Zachary Quinto (Sylar) set to play Nimoyâ€™s younger self. New images of refurbished Starship Enterprise recently made public promise to kick buzz mustering in the upper atmosphere. There is the teaser trailer that premiered with the release of Cloverfield. Paramount is betting that such consumer baiting will wet appetites for the new film far beyond Star Trek’s fan base, which is crucial for the movie to be successful. Abrams has much competition for moviegoers’ interest and much to overcome with the franchise’s own diminished street value. It should be fun to see how Abrams and Paramount orchestrate the selling of Star Trek over the next 11 months, what is given away and what is held close. Positioning the film at comic conventions will be a given. But much more will need to be accomplished–the least of which is a damn good movie. 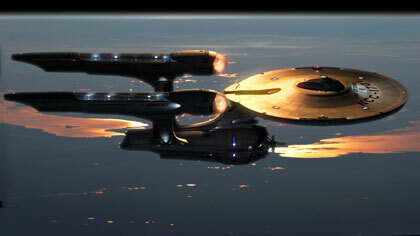 Star Trek warps into theaters Christmas Day this year.